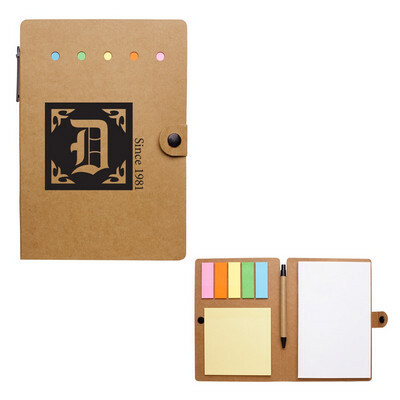 Features: large notepad with pen, flags and post it note,70 Page Unlined Notebook,Matching Pen Has Paper Barrel,Pen Holder In SpineSticky Notes,Sticky Flags In 5 Neon Colors,Kraft Paper Cover. Price includes : 1 COLOUR 1 POSITION PRINT. Setup is included.